The villa is just nestled at the end of an unmade road, being one of only 2 villas in this lane. Comfortably and tastefully furnished. Inside and outside. English satellite TV. Free WI-FI. 50ins HD TV, DVD Player. Log burning fire, lovely and cosy for nights in the winter. The villa boasts the most fantastic unspoilt sea views in a quiet and peaceful location. Ideal for a relaxing holiday to get away from it all. 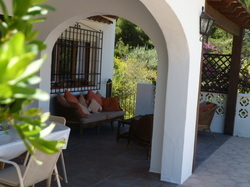 The villa has been totally redecorated, inside and outside.This villa has everything you need for a perfect holiday. 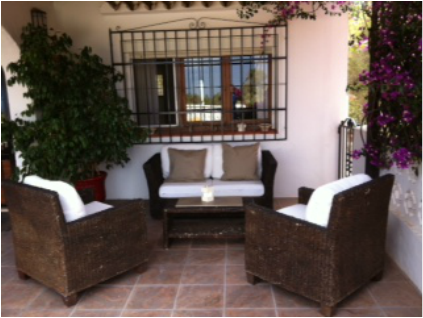 It's location is unique - very quiet and private, yet only a short drive to the towns Moraira, Benissa or Calpe. Lots of outside space to relax - the sun shines on the patio in summer and winter, so there is always somewhere to catch the sun any-time of the year! equally there are lots of shady areas for those who want to get out of the sun. Massive orange groves for children to play and explore. The properties are only shared, if its is a group of people holidaying and paying together. The villa is only 2 kms from the sea, it has unspoilt amazing views. Imagine sitting on the patio, glass of chilled wine, watching the various boats sail by. Listen to the Cicadas buzzing, birds singing, the gentle breeze............ The warm sun! Then a dip in the pool to cool off...................bliss. A quiet shady area, to sit and read, play board games or just chill. Table and chairs seats up 8. Comfortable rattan chairs and sofa, with big cumfy cushions. Dining area over looking pool and sea. Comfortable Rattan seating, overlooking pool and the sea.